As baby boomers age, many are choosing to remain in their homes with some level of independence. But in order for that to become a reality, help is needed. In many cases, care for aging baby boomers is falling on their middle-aged children, who are also living full lives of their own—caring for their children and working. But the dream of wanting to remain in the home doesn’t need to fall by the wayside. It is possible for seniors to obtain the individualized care they need while remaining in the comfort of home. That’s where Senior LIFE comes into play. If you’re caring for an aging loved one who wants to remain independent and in the home environment, Senior LIFE may be an option. Senior LIFE members receive all medical and supportive services to help them continue living independently at home. Services are provided at the local Senior LIFE Center and in the home. Let’s take a look at five specific ways that Senior LIFE can help you keep your aging loved one at home. When it comes to your loved one’s medical needs, socialization likely isn’t the first thing you think of. But remaining socially active is an important part of health and wellness as we age. Being socially active and interacting regularly with peers can help make seniors feel as if they are a true and valued part of the community—and it may also have health benefits. In fact, a study from Rush University Medical Center found that seniors who regularly spend time with others experience less cognitive decline than those who do not. Senior LIFE provides opportunities for members to socialize with others their age through a variety of activities. 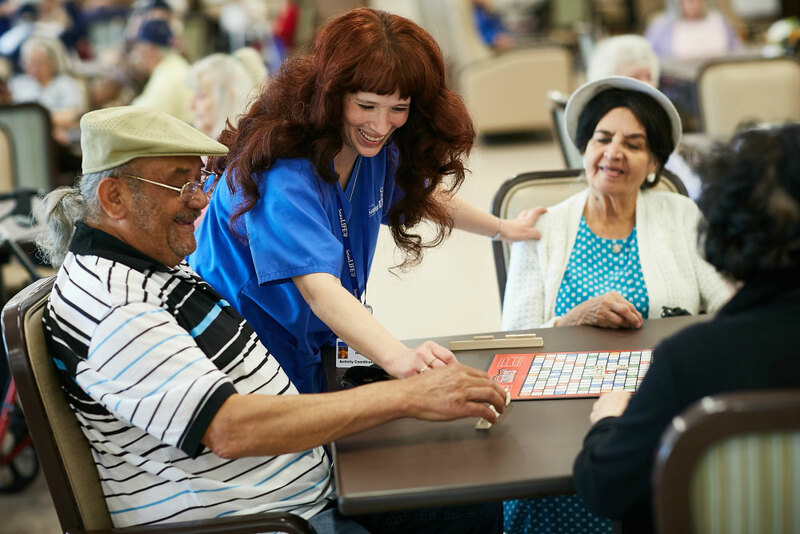 At the Senior LIFE Center, members may participate in games, physical activity, and meals with others, allowing them to stay active and engaged. Many seniors take multiple medications to help them manage a variety of health conditions. Keeping track of many medications can be challenging. After enrolling in Senior LIFE, members receive all approved medications through Senior LIFE. All medications are shipped directly to the home, so that members and their loved ones don’t have to travel to a pharmacy or deal with insurance headaches. These medications are packaged in easily opened perforated packs that are labeled by the time of day they should be taken—morning, noon, evening, or bedtime. Along with medications, members also receive helpful information in both words and images to ensure they understand how and when to take their medications. With Senior LIFE, services are received both at the Senior LIFE Center and in the home environment. Transportation is provided to the Senior LIFE Center and to all medical appointments. We like to think our transportation go above and beyond simply providing transportation. Our friendly and caring drivers are trained to provide assistance to members to safely get them in and out of their homes. In addition, all buses including lifts that help members safely get on and off. This transportation service not only delivers members to and from the Senior LIFE Center, but it also helps ensure they make it safely through the door and into their home or the center. It’s truly door-through-door service. As people age, they often lose some of their ability to walk and stay balanced. In addition, a variety of medical conditions can lead to difficulties with physical health, cognition, and speech. For members in need of specialized therapy services, Senior LIFE offers physical, occupational, and speech/language therapies. These services are included as part of a member’s individualized care plan, which is adjusted as needed based on changing needs. There are no limits to the type or number of therapy services received through Senior LIFE. You’ve probably noticed that daily activities that were once easy for your loved one are now challenging. While you would love to take care of all your loved one’s needs yourself, everyone needs a helping hand. Senior LIFE offers personal care services that help members maintain a sense of independence by taking care of personal hygiene. These services may include help with showering, grooming, and light housekeeping. Your goal is to keep your aging loved one at home for as long as possible. Our goal, at Senior LIFE, is to help make that a reality. To learn about the services we provide, visit www.seniorLIFEPA.com/about.